I debated whether or not to post this dress, but in the interests of being unbiased and sharing my not-as-successful projects too, here it is (plus the unfortunate sight of me without makeup). Found the bust point by trying on my white & blue S2444 and then marking this point on my pattern copy. Mark the middle of each of the original darts at the bodice bottom. Draw a line between this middle point and the bust point. Repeat for 2nd dart. Measure 2cm down from the bust point to mark the dart apex point. Draw lines between the dart apex point and the original ends of each dart leg on the bodice bottom. 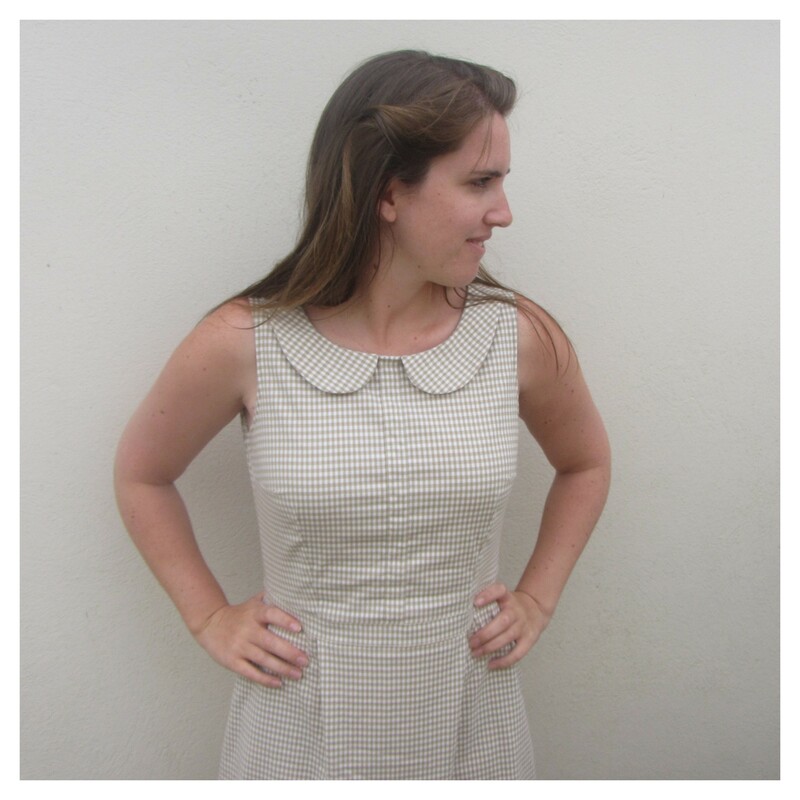 (Think how clever you are and how you’ll never have to buy another pattern ever again). I then rotated one dart to be a waist dart with a vertical central line and the other to be a bust dart with a horizontal central line. But then, after all that faffing around, I chose to use some gingham fabric that has a bit of stretch to it, so in the end, I can’t really tell exactly how well my alterations have worked. Fool. I bought this brown and cream gingham fabric from a fabric shop on Ebay and I’m pretty sure they mistyped the price, as when I purchased it, it was £0.99/m with free P&P. To be fair, I did wait a few days to see if they noticed and changed the price, but then saw that other people had bought some so thought I might as well and could just use it as a muslin. It was advertised as a brushed cotton, but I’m not convinced at all. On the plus side, it’s quite thick so no see-through-ness is going on. The stretch did give me a bit of trouble with pattern matching in a few places, but I was also pleasantly surprised as most of it does match up (although some of my top stitching leaves a lot to be desired). I also drafted a peter pan type collar and a-line, curved hem skirt, both finished with a binding, and a faux placket that I haven’t got around to adding buttons to. As the fabric was so stretchy, I didn’t need to add any fastenings, however when I cut out my pieces, I forgot to minus the centre back seam allowance before I cut it on the fold, which also doesn’t help me see how my alterations fit! 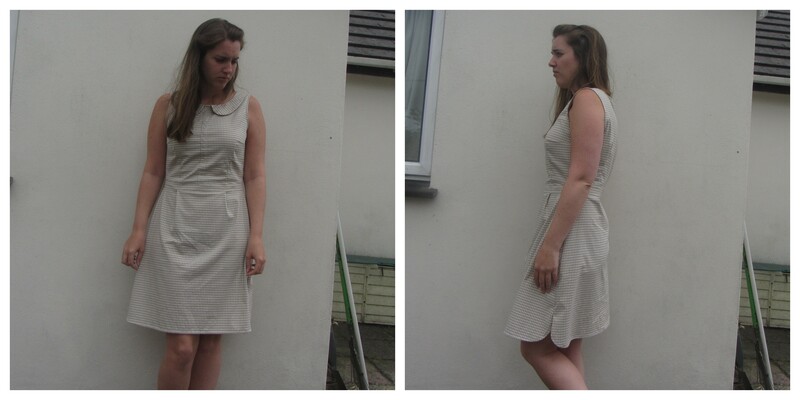 I think in a different fabric, it could be wayyyy better, but in this I kind of feel like a dinner lady or a cleaner. It’s been worn around the house a few times because it is comfy and a decent length, but I’m not convinced it’ll ever be worn in public! However, I have another dart hacked 2444 peplum pattern drafted, but it also involves stripe matching and so far is proving to require too much brain power to cut the fabric. Sometime soon!